SI. No. Name of the Service Status . 1. Indian Railways Personnel Service Meeting of CRC was held on 19.04 .2018 . Approvals of MoS (PP) and FM have been obtained . MoR moved the Draft Cabinet Note. The revised DCN has been received. 9. Railway Protection Force Request of MoR to submit a revised proposal acceded by DoPT. They were advised to submit the revised proposal within a month i.e. June, 2018 . Revised cadre review proposal is awaited. Reminder has been sent on 25.09.2018 . 10. lndo Tibetan Border Police (ITBP) Recommendations of DoE have been received. The meeting of CRC is to be held on 08 .02.2019. 11. Indian Ordnance Factories Health Services (IOFHS) Meeting of CRC was held on 15.10.2018 . Necessary consultations as per directions of CRC are being taken. 12. 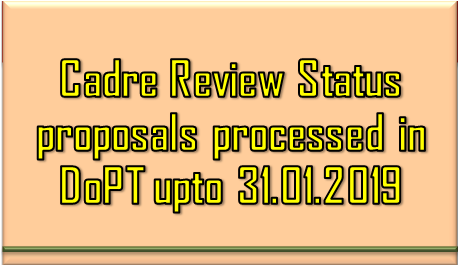 Survey of India Group 'A' The cadre review proposal has been received in DoPT which is under examination . 13. Indian Economic Service DEA was requested for certain clarifications which have been received and are under examination . 14. Indian P&T Building Works Minutes of the meeting have been forwarded to DoT to provide necessary inputs. 15. Indian Supply Service The proposal along with comments of this Division has been sent to Estt. (RR) Division of DoPT for their comments . 16. Indian Inspection Service The proposal along with comments of this Division has been sent to Estt. (RR) Division of DoPT for their comments . 17. Indian Naval Armament Service (INAS) The recommendations of DoE have been received. Note for CRC is being prepared. 18. Indian Defence Estate Service (IDES) The recommendations of DoE have been received . Note for CRC is being prepared. 19. Indian Railway Medical Service (IRMS) Proposal was found incomplete . MoR has been requested to send the complete proposal. Reminder has been sent on 28 .09.2018. 20. Central Health Service (CHS) Proposal was found incomplete. MoFHW has been requested to send the complete proposal. Reminder has been sent on 28.09 .2018 . Note: A calendar of cadre review has been issued vide OM No.1-11019/9/2018-CRD dated 25 .05 .2018 . 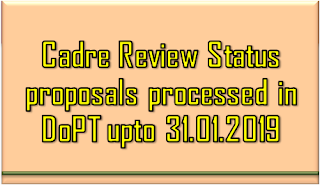 The name of the Service/Cadre along with the month by which cadre review proposal is required to be submitted to DoPT is mentioned in the Annexure . The aforesaid OM dated 25 .05.2018 is available on the official website of DoPT i.e. (Link: Notifications --> OMs & Orders _, Cadre Review Division --> General Circulars). The Cadre Controlling Authority may take immediate action for compliance.